This is really less a comic about a superhero than it is a comic about a teenage girl who also happens to be a superhero- and I’m totally fine with that. The big, interesting conflicts are the ones involving her family, friends, and in this issue, her love life. 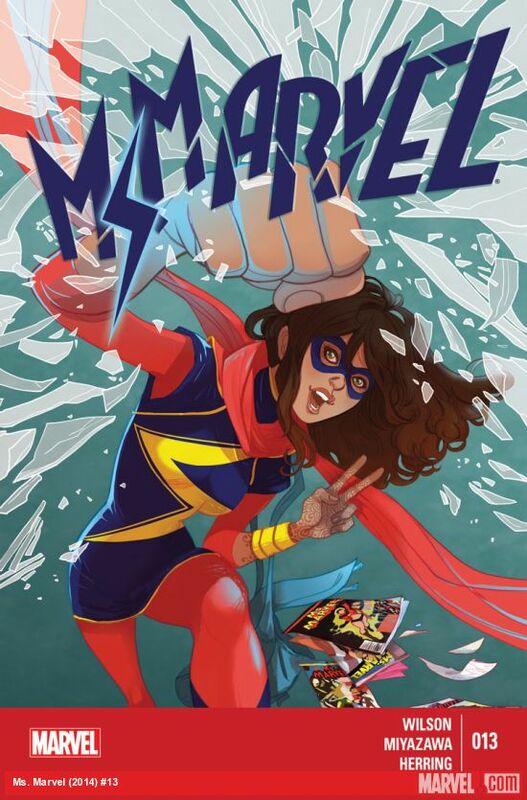 I mean, there’s also some random stuff about new Inhuman factions vying for supremacy, blah blah blah, super hero battles, blah blah blah, foreshadowing of things to come… Anyhow, Kamala Khan is just much more interesting than other superheroes. She’s facing teenager problems. Adorable teenager problems. Man, I’m glad I’m not a teenager anymore. FBP really has a lot more momentum now, what with the imminent end of the world and all that. The obligatory terrible government emergency aid responses are amusing and depressing, and give us an opportunity to hang out with Ina and her mom again. (Ina’s by far the best character in this comic). Cicero being a lady’s man and a badass is a pretty welcome change for him. Hey, there’s an obligatory astronauts (well, dimension-nauts) walking towards the camera shot! No giant science tubes, sadly, though there is a giant horizontal astronaut tube, which is pretty close, albeit not quite the same. Okay, seriously, did anyone think that the new Thor would be anyone but Roz Solomon? Seriously? The series basically telegraphed the hell out of that. My only question now is how she got on the moon to retrieve the hammer. (That, and what Nick Fury whispered into Unworthy Thor’s ear). 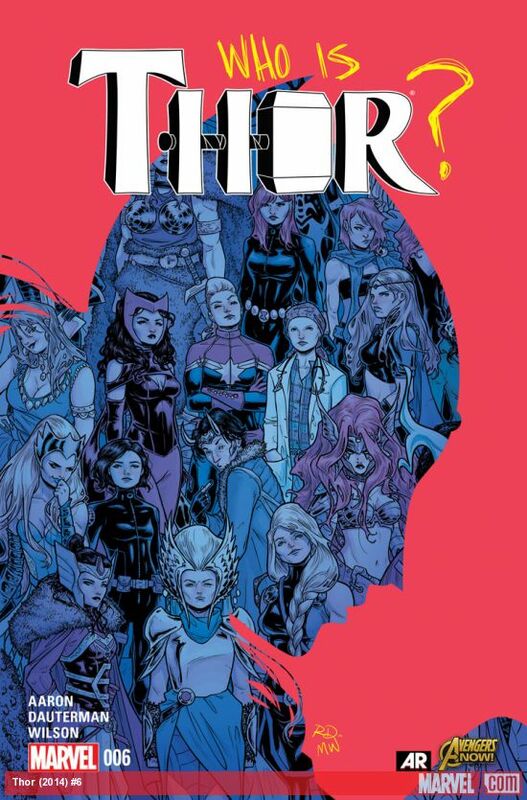 Blah blah blah, Thor has to fight the Destroyer, blah blah blah Malekith and Dario Agger are up to stuff… Actually, we do get to see Agger’s backstory, which is the kind of thing we more usually associate with super hero origin stories. Unworthy Thor talking out his life problems with trolls as he battles them is pretty fun. I dunno, maybe it’s because I’m running a low grade fever, but I’m just really impatient with superhero comics right now. Oh, look. Deadpool. Stuff happens. Paste Pot Pete flies a helicopter. 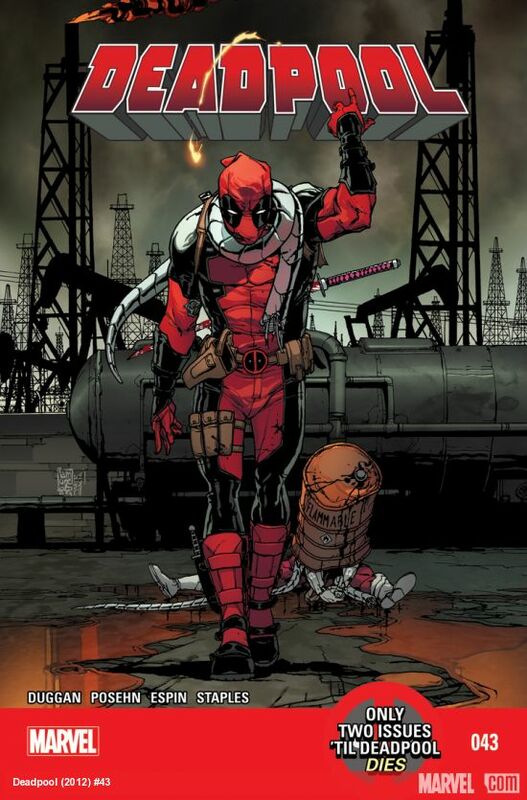 Two issues left until Deadpool dies. Low grade fever whee.